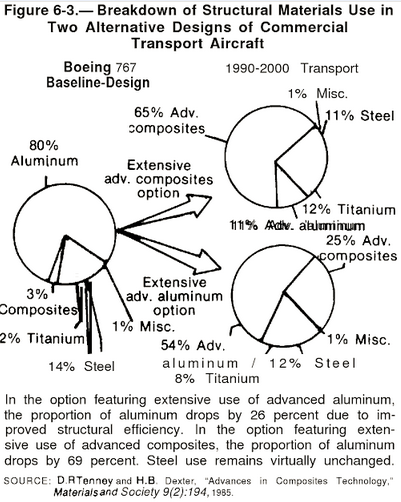 In a Boeing 767, what percentage of the aluminum is in structural components? For a Boeing 767 (model year 2000), does anyone know how much aluminum is in 'structural' components, as a percentage of the total amount? And specifically the wings? Browse other questions tagged aircraft-design boeing-767 or ask your own question. What are the advantages of the B747-8 airfoil over B737's airfoil? Are there specific mass breakdowns for aircraft? How is the fuselage of the Boeing 787 produced? What is the sweep angle of the Boeing 787's horizontal stabilizers? How much lift comes from the fuselage on modern jets? How many parts are in a Boeing 767? What are the “Static Ports” in a Boeing 767?